Online Giving is a safe, secure, and convenient way to make contributions & donations. You can use your credit or debit card for contributions. Your secure transaction gives you access to your online giving history and allows you to manage your recurring donations by emailing a receipt once the transaction has processed & complete. 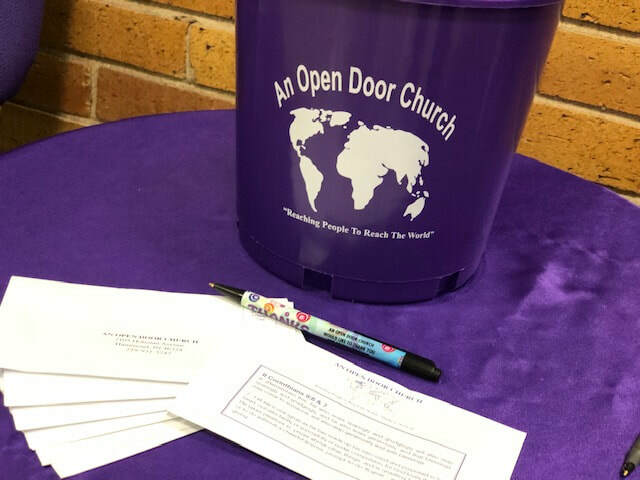 If you have any questions around contributing financially to the life and work of the church, you can email our Finance Officer at info@AnOpenDoorChurch.org. Paper Check: To give by check please make checks payable to An Open Door Church and put them in the offering baskets; or post them to the Finance Ministry of Helps at the church office. Cash: Please put all cash in the envelopes provided during service if over the age of 18 years old or employed. On the front of the envelope please include your name, the amount given, and member number if provided. If you are a tax payer and you have already become a member to An Open Door Church, please contact Elder. Denise Shackelford or email us to request your members number ID. Text Giving: If you wish to give by text please text: Prov1124 to 54244. You will receive a text back directing you to our secure mobile payment option.